Brixton Hill is a ward of the London Borough of Lambeth, stretching from central Brixton to the top of Brixton Hill at the South Circular. It is bounded on the north by the A2217 Acre Lane, and the A23 Brixton Hill and Upper Tulse Hill on the east. The South Circular as Streatham Place (as far as New Park Road) marks the southern border and Kingswood Road and the B221 King’s Avenue make up the western edge. Between the Town Hall and Brixton Prison, the Rush Common side of the A23 Brixton Hill is part of Tulse Hill ward. The Town Hall and Olive Morris House. Christ Church (CoE), Corpus Christi (RC), Orchard (Muslim/multi-faith), Richard Atkins and Sudbourne Primary schools. Clapham Youth Centre is based on Lyham Road. At the centre of the ward is Brixton Prison. We are very proud of Brixton Windmill in the heart of Brixton Hill. The larger housing estates are Saxby Road, Blenheim Gardens, Dumbarton Court and Roupell Park. Parks and green spaces include Rush Common. A range of churches, places for Islamic worship and community centres. Music venues – Electric Social, the Fridge and the Windmill. The population of Brixton Hill ward has risen fast in recent years – from 12,458 in 2001 to 15,842, an increase of 27% (compared to a 2.7% increase in the previous decade). This is 5.2% of the borough population. 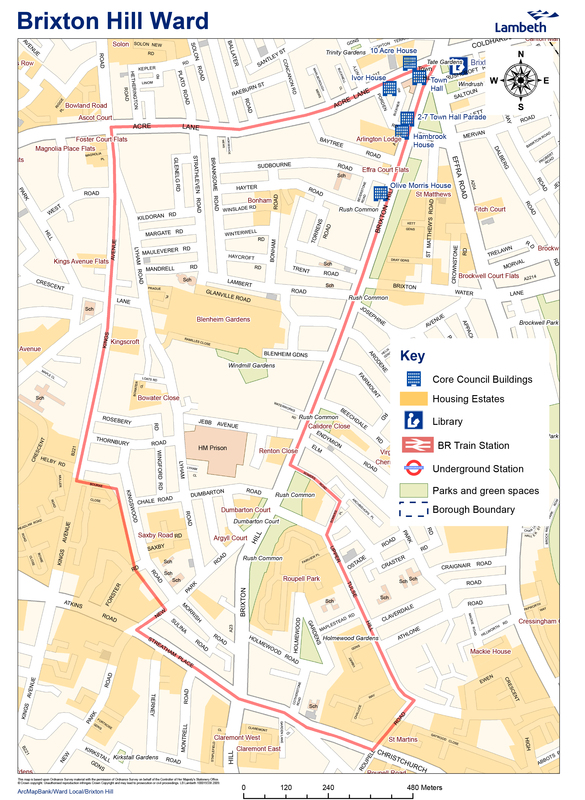 Brixton Hill has an area of 112.9 hectares (4.1% of the borough). For the most recent by-election in January 2013, there were 11,206 electors.